Make Teeth Brushing Fun - Adelberg Montalvan Pediatric Dental PC & Orthodontics too! When children are young and you want them to develop good brushing habits, it’s a good idea to mix a little fun in with it! All too often children look at teeth brushing as one of those annoying things they have to do, and simply demanding they do it to avoid cavities isn’t usually the answer. There’s a few things you can do that can make them eager to brush their teeth. Instead of those plain toothbrushes that adults use, you can find toothbrushes for children that have different themes on the handle. For example, maybe your child likes superheroes, or sports, or maybe even animals. Choosing toothpaste made for children can also make a difference because let’s be honest, when you were young you probably weren’t too fond of the aftertaste of regular toothpaste. Children’s toothpaste often comes with more attractive flavors such as sparkling bubblegum, different fruits, and even other candies. Just make sure your child understands not to eat the toothpaste or mistake it for food. Help your children look at fighting cavities as a fun game. For example, you could have visuals of cavity monsters and show your child how they can beat that monster by brushing their teeth the right way and doing it thoroughly. Other children might like hearing music made for brushing teeth or a fake toothbrush and using it on stuffed animals. Other things that might get them excited are TV shows or videos that encourage them to brush teeth or portray it in a fun light. 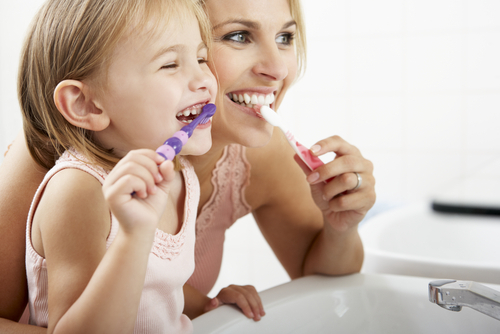 Helping your child learn good brushing habits is something we do regularly here at Adelberg Montalvan Pediatric Dental in the Massapequa, Massapequa Park, West Islip and Nesconset areas of New York. We know young children can feel nervous or scared about their first dental visit, so we make sure they enjoy their visit and are treated well. Our hygienists and dentists have years of experience treating young children, as well as teens and adults. If you’d like to know more about our clinic locations or schedule an appointment, visit www.adelbergpediatricdental.com and look for a location most convenient for you, or you can either call us or fill in an appointment request online.